Recipes in a Jar - Easy, Tasty, Gorgeous! Quality recipes in a jar are absolutely the "main ingredient" for great-tasting gifts in a jar. It's both simple and inexpensive to throw together a mix in a jar and these easy gift jar recipes from Homemade Gift Guru as well as reviewed recipes from around the web, will ensure excellent presentation and taste as well. Whether you need a sweet mix, snack mix, beverage mix, canning recipe or bath and body mix, you'll find great recipes in a jar here. It's true, gift jar recipes make fantastic Holiday and Christmas recipes to share with friends, family and coworkers but you can give them any time of year! This chewy oatmeal cookie recipe reminds me of my own G-Grandmother's famous oatmeal nut raisin cookies. This is one of those mason jar cookie recipes with gorgeous looking layers plus they make super easy and delicious oatmeal cookies too! This chocolate cookie recipe in a jar makes the MOST delicious brownie-like cookies! Each cookie explodes... not with a harsh chocolate taste but with a delightful buttery chocolate taste worthy of being savored. My family sometimes refer to them as brownie bites because they taste so much like chewy brownies. This is a very unique recipe among recipes in a jar. I made it much more exotic than powdered chai tea by using whole Indian spices. If you've never used whole Indian spices (for example star anise and cardamom pods) you're in for a surprise. The use of these spices make a stunning gift and the chai tea they make tastes exquisite. This homemade coffee liqueur (a.k.a. homemade Kahlua) is easy to make and turns out fantastic, with lots of rich coffee-caramel taste. Be forewarned however, that once you flaunt your homemade Kahlua skills, you'll be getting repeat requests (possibly for the rest of your life). Note: Homemade Kahlua and other liqueurs are alcoholic beverages, so please follow all the laws in your area and use common sense when giving this alcoholic gift. This is a super simple basic bath salt recipe with excellent results! It can be customized to your liking. The recipe includes lots of ideas for creating colored bath salts, moisturizing bath salts and various scents, including lavender, jasmine and mint. This pale yellow bath salt warms the skin and refreshes the cells. Try making this bath salt gift for a tired mom and include a coupon for one night of babysitting. Also this recipe makes a great foot soak... it works wonders on tired feet. 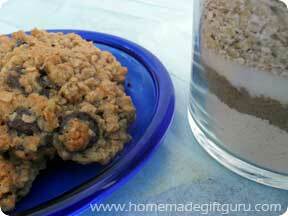 These oatmeal, chocolate chip, pecan cookies are yummy. My advice however, is to layer the mix starting with the flour, baking soda and salt, then the remaining ingredients in the order given starting with the oats. 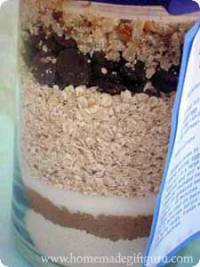 Be sure to pack each layer firmly and then stuff as many chocolate chips as you can to fill the jar. For this recipe and other recipes in a jar, you may like to read these easy gifts in a jar tips. Yummy cookies. My favorite thing about these cookies is the look of the layers - great color and contrast! Also known as "Cranberries in the Snow." This is a great mason jar cookie mix that looks good in the jar as well as coming out of the oven. To ensure this mix fits perfectly in your jar, I recommend you avoid heavy packing down of the ingredients. This is one yummy mix! There are no layers in this one, you just make the mix and embellish the jar. This recipe can also be found in Diane's book, The Perfect Mix. This chocolate, chocolate chip and vanilla chip brownie is so much better than any mix I've found at the store. I've gotten fantastic reports from gift recipients as well. My advice, use 1/2 cup oil instead of the 2/3 cup that is called for. This will make for a moist and balanced brownie but not too oily. My love for rich, chewy brownies led me to try these as soon as I saw the recipe. As a jar gift, the layers are simple with only two substantial layers of color but they do look nice and the cost is among the cheapest of all jar gifts I've come across. Plus you can feel proud to give this as a gift because these brownies are extremely rich, chewy and sweet. Put this in a basket with a selection of tea for a really nice "just because" gift. It's extremely easy to make (which is great for the recipient) and you can actually use other pie fillings as well. Try apple, berry or cherry pie filling for something different from peach. I also recommend including a can of pie filling (peach or other) so the recipient has everything they need. Delicious and looks pretty in the jar. Layer the blueberries on top and give this homemade gift in a jar by itself or as part of a breakfast basket. Include homemade blueberry syrup and blueberry tea for a cute blueberry basket gift. There are many coffee mixes available. This Country Cappuccino Mix is a very basic mocha mix and very good. This is so easy yet it turns out elegantly beautiful and tastes gourmet. You could always make your own marmalade but the simplicity of this fancy marmalade recipe is part of it's unique appeal. This is a great recipe for gift giving. I like to give it along with homemade pancake mix in a cellophane bag. This is a great summer time project (especially if you have nectarines, lemons and/or basil growing in the garden) that can be used for homemade hostess gifts throughout the year or saved special for the holidays. These almonds are so rich and salty, they are fun to give with homemade chocolate truffles and can be layered with other nuts and chocolate for a unique jar gift. I've given these for homemade hostess gifts, as well as homemade gifts for my co-worker friends (they make a great pick-me-up while at work). Homemade granola makes a fine jar gift. The more colorful dried fruit you add, the better the presentation. I added dried cranberries to this in addition to the dried blueberries. It was quite good. I also took the advice of other reviewers and reduced the butter a bit - but that is truly optional, the butter is tasty. Either way, it is a nice gift and goes well in a homemade breakfast basket. Finally... printable gift tags made JUST for homemade gifts!